Labour and the SNP made the same promise to the electorate in May: that we would maintain free higher education for Scotland’s students. And that was a mistake. Because we can’t. And even if we could, we shouldn’t. The Graduate Endowment which the previous Labour-led Scottish Executive introduced in response to tuition fees being introduced in England was a silly, messy compromise of which no-one can be proud – a half-way house that raised nothing for universities but still managed to antagonise students. The SNP abolished it to great fanfare after they came to power in 2007 in order to cement the principle that all education, at whatever level, whether mandatory or voluntary, must be free. And this isn’t about simply copying England in order to impose a uniform higher education structure across the UK. But at the same time, we would be foolish as a nation to turn our backs on a solution just because our larger neighbour has gone down that path. And the result of tuition (and top-up) fees’ introduction in England is that their universities will be far, far better funded than Scottish ones, if not now, then certainly in the long run. The funding gap simply cannot be met by the public purse once all those £9000-a-year courses start to bring in the cash. Unless, of course, we impose even greater cuts than are already planned by the Scottish Government in order to continue subsidising Scottish universities. Would that be politically acceptable? Or even morally acceptable? 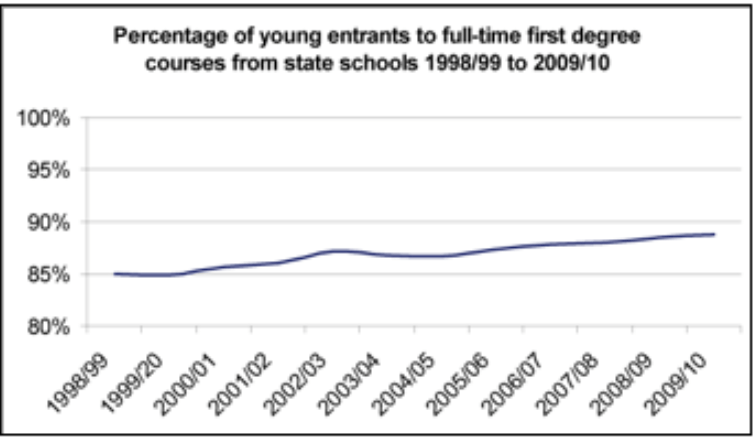 When the Commons was preparing to introduce top-up fees in 2004 (though they weren’t actually introduced until after the following year’s general election), we were warned that student numbers would plummet as a result. Even worse, students from working class backgrounds would be deterred from applying to university for fear of plunging themselves into debt they could not repay. So what makes opponents of tuition fees believe that Scotland is so different from England that an expansion in higher education here would not attract more students, would not disproportionately benefit state school pupils as it has done south of the border? Let’s remind ourselves about the rules as they apply in England: no-one has to pay up-front fees, and you don’t have to pay back anything until your salary has reached a certain level (currently £21,000). Scotland wouldn’t have to go down the same route as the UK government (who rejecting Lord Browne’s recommendation that the annual cap on fees be lifted to £6000; they raised it to £9000 instead). Ministers could decide what the Scottish cap should be, in consultation with student organisations, employers and the universities themselves. Yes, tuition and top-up fees were about governments trying to cut their public spending commitments. But it was also about allowing universities to open up new revenue streams so that they could compete internationally. And it’s the fear of not being able to keep up with their British – let alone their international – competitors that is keeping Scottish university principles awake at night. Sure, they’re keeping quiet publicly for the time being, but many of them are desperate for the Scottish Government to see sense, and to bow to the inevitability of charging for higher education. And yes, it is inevitable. Whether we blame the UK government (and the SNP will) or the economy or whoever, at some point, sooner or later, the Scottish Government will introduce tuition and top-up fees. There will be much protest and demonstrations and gnashing of teeth. And after the deed is done, university provision will expand, student numbers will increase, more pupils from working class homes will find themselves with letters after their names, and slowly – ever so slowly – Scotland’s universities will reassert themselves in their rightful place as international beacons of academic excellence. Tom Harris is the Labour MP for Glasgow South. I’m still waiting for someone to give me a proper, rational explanation of why the level of funding in English universities matters a damn relative to Scottish ones. If Scotland’s been able to fund its universities since 1999, why would they suddenly need hundreds of millions of pounds extra now to provide the same services? “Competition”? Competition for what, exactly? Demand for Scottish university places already outstrips supply by a distance, and that’s only likely to become more true as the terrifying cost of tuition in England takes hold. Are our universities producing graduates with third-rate degrees now? Not that I’m aware of. So what do we suddenly need so much extra money for, to fill a “funding gap” that has no discernible practical meaning that I can discern? Just saying “competition” all the time isn’t an answer. I agree. The only argument for it should be are our universities not able to produce graduates of the calibre Scotland needs and that extra funding would help them to do that through better facilities, paying for better lecturers etc. I dont think anyones made that argument for fees (either here or down south). here it all seems to be about competing with other institutions in England, and down there its all about reducing the deficit (which as Bandages points out is actually going ot make the situation worse, as the Government needs to borrow more money to fund the student loans!). The other possibility is of course to fund those better facilities through government spending – direct capital grants, subject to appraisal. Though if any sector really needs the investment, I would argue that its the further education colleges, and not the universities. Its not more graduates Scotland needs, but more people with the real life skills we need. The market for university staff is a truly international one. If Scottish universities cannot afford to pay for the best lecturers and academics to teach our students, they will, perfectly understandably, go elsewhere. There’s also the question of research, which is as expensive as it is vital to our economy as well as to our universities. All of that has a knock-on effect on students: do we really want our universities to become the third or fourth choice for academics and students? We’re not in a union with China or France though. There’s a more basic point that you are imissng though, whether or not Scottish students (as constituents of Scottish MPs) go to English universities. If English universities can charge up to a39,000, then they will be better institutions quickly (assuming some of the money is reinvested in facilities and, crucially, staff). Scottish universities won’t be able to compete and staff from up here like your NHS doctors going private will follow the money, leaving our universities worse off. This impacts on our students falling standards, both in the fact that the universities here don’t have the same levels of funding and because their staff are perhaps of a lesser quality.For me, that legitimises Scottish MPs voting on the issue. Well, we are in a union with France but not one that involves hivang a say over the other’s domestic budget. And, similarly, the UK union is arranged such that England doesn’t have a say over how Scotland spends its education and budget and Scotland shouldn’t have a say over England’s, as both the Conservatives and Lib Dems agree going by their proposed solutions to the West Lothian question.I agree with your point though that the advancement of English universities and colleges to the direct detriment of Scottish equivalents allows Lib Dem MPs to have a vote, but only against the proposals. I do not see how, through either the pledges, the impact on Scottish universities and/or through the West Lothian question, any Scottish Lib Dem MP could bring themselves to vote in favour of these proposals. Hence my waiting and seeing with baited breath what these undecideds decide to do.Abstaining is just about fair game I reckon. You say that, without tuition fees, “The funding gap simply cannot be met by the public purse”. The Public Accounts Committee says that with tuition fees the public purses faces a “potential funding gap of several hundred million pounds”. There is a much deeper argument, which the SNP articulated very well in the recent Scottish Elections, about whether education as a social good, comes at a cost to communities at all. A better educated society is a society with less crime, fewer health problems, less drug and alcohol misuse, that earns more and spends more. The preventative savings from education, therefore, go to fund local services. But you haven’t touched on that, have you? No, you’ve been too caught up with the argument as to whether we should prefer the Scottish public funding model (Government pays) over the English (Err . . . government pays, according to the PAC). As I said above, oh dear. . .
Come on, Tom, you simply don’t understand what is going on. Once upon a time in America a long dead economist dioscovered that there was a high rate of return to the individual student from doing their degree. This was seized upon as an argument for charging students. However, as the proportion of the age cohort who go to university reaches up to 50% and beyond, the rate of return to the individual student is bound to fall. Going to Uni becomes just an economic necessity to just stay level, not get ahead. As private returns are levelled out you get the perverse incentives for students to seek a higher cost university (or the new private university college) in an attempt at creating a new advantage. Also as fees become the new normal, the next normal is that the universities become privatised and their curriculums distorted either to the excessively commericla or the excessively antique in order to respond to market pressures. Do you really want our universities to become private businesses rather than communities of scholars responsible to the truth and to the nation? If you must charge, then fees and scholarships are an extraordinaryly complicated and mystifying way of what can be dome far better by having a proper graduated income tax. Politicians have got themselves and us in a mess through their cowardice about tax. I have to say I think James is right here. Tertiary education should be paid for from income tax. Having a separate tax or fee system for graduates becomes silly when participation hits the levels it has done. On the most basic economic level an educated workforce is a national asset. I would say that part of the problem is being seen as “less prestigous”. We’ve seen many universities down south charging the full whack simply because they dont want to be seen as somewhere thats less desirable to go to study. I wonder if part of this demand for fees from the university sector up here is part of the same problem. If university training produces people who earn more money – then they will pay more tax. Surely a calculation can be done to estimate how much extra tax a graduate will pay compared to a non-graduate? Could not some of this go towards paying for a good quality education at university? The problem, of course is having suitable jobs FOR graduates, whereas what we seem to have ended up with is situations where employers demand degrees as qualification for jobs simply to reduce the number of applicants. It is assumed that graduates go on to receive higher salaries. They therefore pay more tax, giving back for the next generation of students to benefit. As they always have done! But you’d like them to pay the higher rate of tax + national insurance + another new tax? Was that not obvious from my post? The basic argument for not introducing tuition fees is that the vast majority of people in Scotland are against that. That is why Labour adopted the same policy as the SNP. They did the polling and found the same thing that the SNP did. I find it odd to describe this as “bottling it”. Any party that goes against what most people support would be daft rather than courageous. It is not cowardice to put forward policies which are supported by most voters. It’s common sense. Yes of course it presents problems and challenges but overcoming problems and meeting challenges is what governments are elected to do. I wasnt aware of that poll. So the question is do we do something out of principle (ie the principle of free University education) or do we do something thats popular? Or is it, not necessarily something that people WANT, but something they are resigned to? John – We should introduce tuition fees on the principle that it would be a fair and progressive move, irrespective of whether it is popular or not. I only quoted the poll because the previous commentator had suggested that the vast majority of Scots are against them (although I would suggest to Indy that her view that “Any party that goes against what most people support would be daft rather than courageous” is a good argument in favour of the SNP dropping their policy of independence). Of course I may be wrong, but I see the choice as between introducing fees voluntarily and making a virtue of it, or doing it later when we’re forced to. Whatever the pros and cons of this debate are at a fiscal level one fact is unequivocal. The aversion to higher education by potential students caused by being debt laden to the tune of £30 – £60K is immense. I can tell you this as the eldest of one in five children who was financed through medical by my taxi driving father in a 3 bedroom flat in the southside of Glasgow. If I had to go through the same experience again with threat and worry of such debt I simply would not have. And therein lies the rub; with the sanction of such policies we are in danger of reversing two generations of social progression and mobility to an almost pre WWII era. You may wish to tell your grannies and mummies in your consituencies that their services are safe. But please also tell them that their children and grandchildren will pay the price most acutely in those parts where they are perhaps the first in their family to climb the higher education ladder. Just as the death of comprehensive school model signaled an admission that all children cannot be schooled uniformly perhaps the best way round our higher education issues is to adopt a similar plurality. University education is not for everyone and we need to accept this rather than making it the holy grail for all school children to aspire to. Economic providence dictates we downsize the choice of courses we offer with scientific and vocational studies assuming a new priority. I don’t deny your strongly held views, Zubir. But why, in your opinion, has the introduction of fees in England been followed by an increase in the number of people applying for university, and a proportionate increase in applications from kids from a poorer background? The problem with diolvuteon is it is incompatible with anti-discrimination laws.Regardless of place of birth, everyone is a citizen of Britain. To impose fees by way of place of birth is akin to saying only whites should pay fees .That is why Scots MPs will always have a vote at Westminster. British votes for British parliament.Of course, independence removes the inherent discrimination as a state is empowered to do the best for it’s own citizens. A devolved parliament is simply creating different forms of discrimination, and is unsustainable in the long term, it benefits no side. You are right: money matters, and the SNP had more of it and used it very eeftcfively. As you point out, it brings professionalism and focus. But your final line gives away a lot of the problem if you still think that the Labour Party had the intellect in this election, then you really have learned nothing. You may have had spirit, I don’t know. But Ken MacIntosh had clearly been drinking it when he tried to argue on Sunday that the Labour Party had won most of the intellectual arguments in the last Parliament. In what way was the mandatory sentence policy an intellectual victory? Or the Labour Party’s approach to alcohol pricing? Or the vindictive, partisan, this’ll stick it up them’ decision to insist on Edinburgh trams?I think you have it the wrong way round. You lost the election because you lost the arguments. As others have noted, you need to have a sense of what you are arguing for and a sound set of beliefs to argue about if you wish to win the intellectual battle. The Labour Party in Scotland displayed neither in this election. You lost badly because the SNP had the money, the professionalism and the ability to drive their better messages more eeftcfively. The argument relates to thresholds of acceptability. Whereas previously fees that were introduced had an element of proportionality in reference to perceived fairness. The current system when implemented will not. If we are going to talk statistics then it is too early to tell the impact of the current proposals and if implemented it will be too late to redress the balance. There are other ways of looking at the statistics the author alludes to. It is a cold hard world out there. Jobs of any quality whatsoever are in short supply. Young people have to make a decision as to their future. So, along with their families, there is a tiny, repeat tiny, relative increase in the numbers attending from state schools. What does that tell us about the society we live in? That people make decisions in their own best interests, despite – rather than because – of the front-loading of costs on them? Despite, rather than because of any investment in them by their country? I rather suspect that that is the case.